We also hold expertise in successfully matching up with the demands of "Non-sparking" tools. 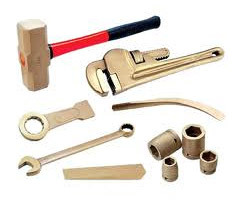 These are specially constructed tools sets that bear a reduced sparking possibility while in usage and are made available in construction metal options of brass, bronze, monel copper-aluminum alloys, copper-beryllium alloys and others. As these "non-sparking" metals have in them less tensile strength, one should also note that these are softer and wear down quickly than in comparison to ordinary steel tools. We are one of the most prominent manufacturers and exporters of Non Sparking Tools. These Non Sparking Tools are manufactured using quality range of raw material and are available at the most competitive prices in the market.